The round sports a boat-tailed projectile design for improved long-range accuracy and ballistics performance. I have ran this through 4 classes now, Defensive carbine I and II, mid range rifle, and a Sentinel Concepts Critical Carbine Employment II. It has ran perfect through it all. I have ran around 7-8K of this and the only issues were a few failure to feeds (my fault for not cleaning for 3K rounds) and I have found a few that had case deformations from manufacturing (5 or 6 through all 8k). Accuracy is standard and consistent, between 1 and 2 MOA. I had no issues getting first round hits on 10 inch steel gongs at 300 yards in the mid range rifle course. Recoil impulse and ejection patterns are consistent through out. All were ran (and will continue to be run) through my BCM. Specs are: 14.5"BFH BCM mid length upper, Spikes lower, geissele H buffer, geissele SSA-E trigger, Trijicon 1-6, standard Okay Industries mags and HK Steel mags. Have roughly 13K through this gun. For awhile I thought I was having issues with my hammer or light primer strikes. Finally took my rifle to the shop and went with an employee to go and shoot a few rounds. In total, 20% of these rounds simply will not fire. Strike mark on the primer is solid, but the rounds would not go off. Ran them through a second time and the same thing. This has happened on my last 4 trips to the range. Just some bad, cheap ammo. I bought this ammo an it was shipped fast. It ran threw my m&p 15 perfect with no flaws.. 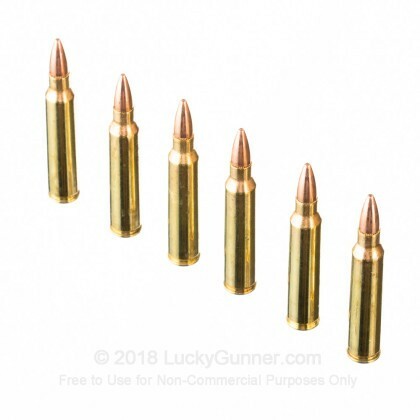 I would highly recommend this ammo an would highly recommend lucky gunner as the go to place for ammo. These people are amazing an I also subscribe to there YouTube channel...THANK YOU GUYS SO MUCH!!! After doing my research and checking out who had the best fair price I am so glad I went with lucky Gunner. Ammo was at my door in two days and I was shooting this evening. Bulk packing but with the free over box and packaging it came perfectly fine. Will be getting more when I pick up more ammo cans. I've gone through several thousand rounds without a misfire or jam. My rifles are kept very clean. Although I've read from other reviewers that some of the rounds in the bulk packaging have been dented beyond use, that has NOT been the case with the cases I have received. When you compare price to value Federal American Eagle is the way to go. By the way, I am simply a satisfied customer, I get no compensation of any kind for completing this review. Good stuff. The Predator eats it up! Last time I shot this much was in War Zone III, RVN. have run 100 rds thru my ar15 but no FTF or FTE. Will buy more. 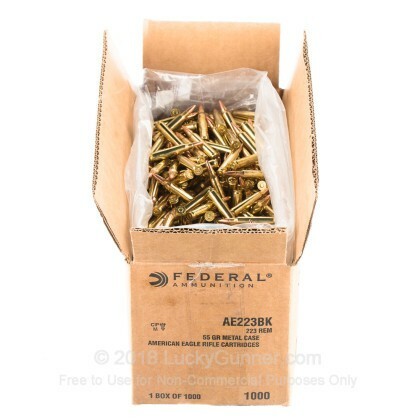 Lucky gunner has excellent service, quality ammo and fast shipping. 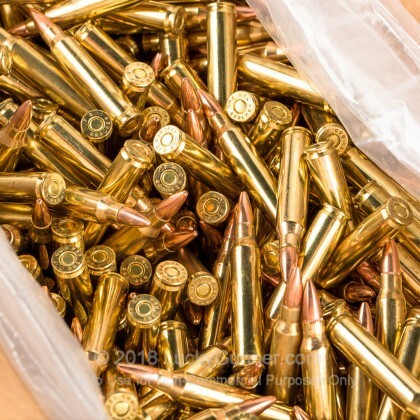 Excellent service, quality ammo,at a good price. I will be ordering more from Lucky Gunner in the future, that's for shure!!. Speedy Delivery; Product as Advertised; Great Price! Once again Lucky Gunner has lived up to its reputation; great! This ammo fires perfect and with less residue than I have experienced from others. I did have an issue with a 45ACP order some time ago and could not believe how fast (on a Saturday no less!) that the issue was rectified, no questions asked! I will continue to order from Lucky Gunner. They stand by their customers; and deliver! Great value, super fast shipping and great product! What else do you want?? Great to deal with!! All of my AR's really like this stuff. It's much more accurate than M855 and for target practice or just plinking its great. I suspect that this is really military ammo of some sort. The primers are crimped and sealed, and I wouldn't be surprised if the bullet tumbled and broke up on impact just like the 55 grain military round. If you are willing to take the crimp off of the primer the cases are excellent for reloading. With 223/5.56 so cheap its not worth reloading, but when the next ammo scare comes around and the supply dries up, its nice to have a few hundred recordable cases on the shelf so you can keep shooting. My rifles will group this under 1" at 50 yards, and that's with me shooting so you can probably do better. I try to always have 1000 rounds of this on the shelf because its the best ammo around for AR's. See the Lucky Gunner Labs for a 10000 round test. So far I am satisfied with the product. only down side was the packaging of a huge plastic bag with 1000 rounds. was hoping to receive boxes that would be easier to control and store. Great product look forward to another purchase. Great product very consistent groups and clean residue not that black bad hard to clean stuff. Last night I gave a pretty negative review on the above ammo. I based my review not on how this type of ammo shoots, I was pretty negative about how the brass looked. Well I now take back my negative remarks because today is the first chance I had to start using this ammo and can only rate this .223 as a fantastic round. I went out today and fired 300 rounds. I used 50 rounds to zero in three of my scopes. First 25 rounds were zeroed in at 100 yds, the second 25 rounds were zeroed in at 200 yds. These 50 rounds were bench fired using two sand bags. The remaining 250 rounds were shot using different shooting positions. At 200 yards it took me almost the full 50 rounds to place a nice group using an EOTech with a 3x magnifier. I had absolutely no problems with all the rounds I fired. I would recommend this ammo to anybody. Tomorrow I am going out with 300 rounds of 5.56 Hornady's . Getting ready to order another 1,000 rounds "after" I test four different types of the .223. I'll then do the same order after I fire the different Hornady's. my order arrived quickly. every round I've fired so far has performed very well. great product and good value. I got the product fast, but have not had a chance to go out and shoot any yet. Excellent product! Lucky Gunner Rules! First, let me say that Lucky Gunner is awesome! Awesome prices! Awesome service! Fast delivery! The Federal American Eagle .223 is great ammo. Runs clean, never had any problems with it. Best price on the web. I will continue to do business with Lucky Gunner! Reasonably-priced ammo for this market. Thanks LG! AS ALWAYS, THIS AMMO WAS JUST WHAT I EXPECTED. AND IT WAS DELIVERED WITHIN 48 HRS OF PURCHASE? WOW!! GOOD JOB LUCKY GUNNER! YOU'RE MY AMMO SOURCE FROM HERE ON OUT! Federal .223 FMJ-BT Great service, product and value! This is my third order of this product and I am completely satisfied with both this Federal ammo and the customer service and promptness of LuckyGunner!! No feed problems, no misfires. Good brass and muzzle velocity (chronographed) is very consistent. The best company I've found! I only buy from Lucky Gunner these days (about five years). Use to shop around, but that was a waste of time. All I ever found was that they were the best on virtually every level. I only buy in bulk, and they deliver usually in 2 days. You will not find a better place to buy your ammunition, I know, I've tried and there is no other. LuckyGunner shipped completely and quickly. I've had other vendors charge my credit card and ship weeks later. LG put the order together and shipped it quickly. This is what everyone expects from a company. LG prices were even better that other sites! Bottom line: I will do business with LG again. Lucky gunner gives great prices for a great product, THANKS!! 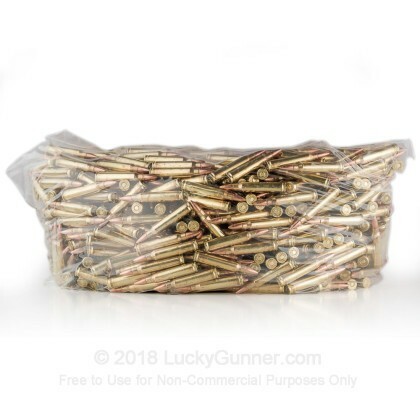 Ammo is great and shipped fast. I live in TN so that helps. Thanks Luckygunner! I like how it burns clean and they run true all the way through. Good price on this to stock up with. Good price and clean. Will purchase again. Accurate ammo with a value price. Would buy again. I am very pleased with this ammo. I am also very pleased with the service from Lucky Gunner. The item was in stock and shipping with quick and trouble free. Great to deal with. Will use again and recommend to my friends. 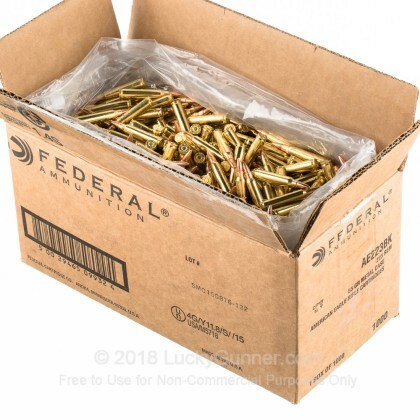 Q: Do this ammo come in boxes or a bag? Been getting some federal in bulk and I’m comes in a bag. A: Hi Tyler. This particular deal of American Eagle comes in a bulk plastic bag inside the case. This allows for the lowest cost product from a manufacturing stand point. Q: What is the rated velocity of these rounds? A: Hello! 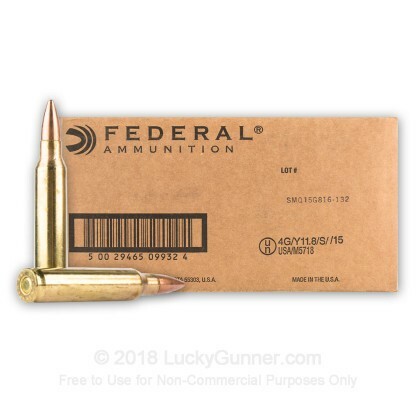 Federal lists the muzzle velocity of this round at 3240 fps. Q: Do these rounds contain steel at all? A: Hello Leah, This ammunition is loaded with a lead core, copper jacketed projectile. There is no steel in this projectile at all. Q: What does a case of a thousand rounds weigh? A: Hello Larry, The total weight of this case is 26.5 lbs. 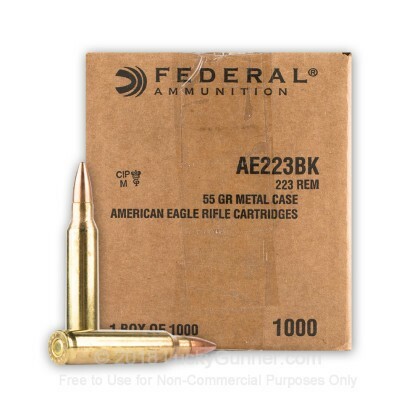 A: Hello Ralph, This Federal ammunition is loaded in a boxer primed, brass case that can easily be reloaded. Q: My new colt M4 carbine has it stamped right on the weapon as "Cal 5.56MM." I just got this weapon and have not fired a single round through it. I have been buying .223 and 5.56 55 grain, manufactured by Winchester. Also bought Hornady.223 55 gr V-max, Wolf Gold .223 Rem 55 gr, Independence 5.56X45mm 55gr that states, on the box "AR-5.56 and finally, Winchester Varmint X, .223 REM 55 gr with a polymer tip rapid expansion. So after reading all the reviews, I need an EXPERT evaluation on which type I should be shooting ~ 5.56 or the .223. It does not say on the weapon anything about it being a rifle that is a .223, just states, as I said above, 5.56mm right above where the magazine is inserted. Also what manufacture would one recommend. 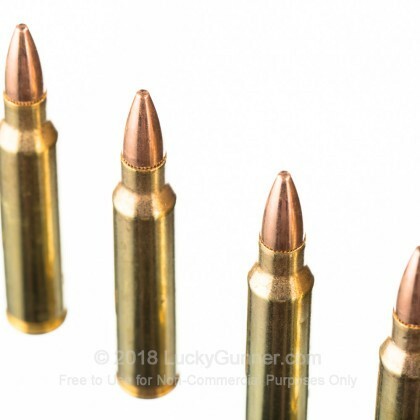 I bought the different types of manufactured ammo so I could try to determine which rounds would be the best to obtain the absolute best for shooting up to 200 Yds. I now want to order 1,000 more rounds but sure don't want the weapon to explode on me. Thanks for any feedback - greatly appreciated. A: Hello Bill, Congratulations on the new Colt! Since it is chambered in 5.56, you can shoot both 5.56 and .223 safely. 5.56 has a higher chamber pressure than .223 so a rifle chambered in 5.56 can shoot both, but a rifle only chambered in .223 can only shoot .223. As for the ammo, it will depend on what you are using it for. If it is just for target shooting, then something like the .223 PMC 55gr. 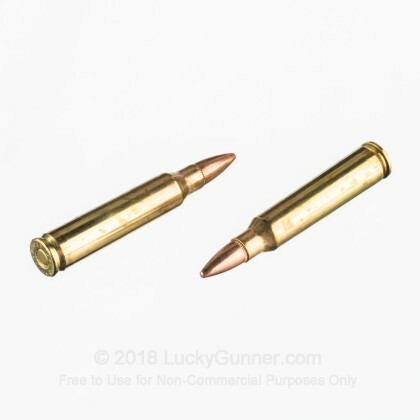 FMJ-BT rounds would work great or the 5.56 55gr. M193 rounds. For hunting, the Winchester Varmint rounds and the Fiocchi and Hornady V-Max rounds work very well. Since you have a lot of different rounds already, you can safely shoot them in your M4 and see what you think of them.